Black flame: the revolutionary class politics of anarchism and syndicalism. Counter-power volume 1, By Michael Schmidt and Lucien Van der Walt. Edinburgh and Oakland, CA: AK Press, 2009. Pp. 500. Paperback £18.00/US$22.50, ISBN 978-1-9048-5916-1. 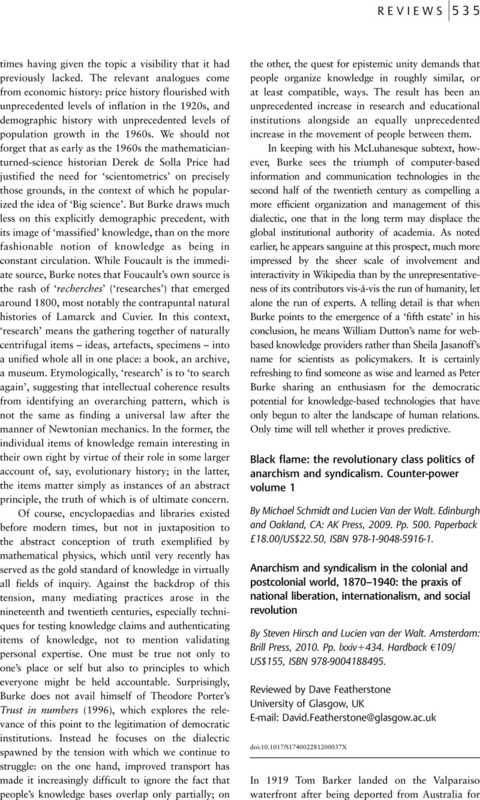 - Anarchism and syndicalism in the colonial and postcolonial world, 1870–1940: the praxis of national liberation, internationalism, and social revolution, By Steven Hirsch and Lucien van der Walt. Amsterdam: Brill Press, 2010. Pp. lxxiv+434. Hardback €109/US$155, ISBN 978-9004188495. 3 See T. Barker, Tom Barker and the IWW, recorded, edited, and with an introduction by E. C. Fry, Canberra: Australian Society for the Study of Labour History, 1965.